Today I wrote a readable & usable implementation of Norvig's Spell corrector. Norvi's implementation of spell check is awesome! On his site he has link to many other implementation in various languages, including C#. Most of the implementation are focused on minimum number of lines , so they are not readable. I have written my own implementation which you can use on your own risk. 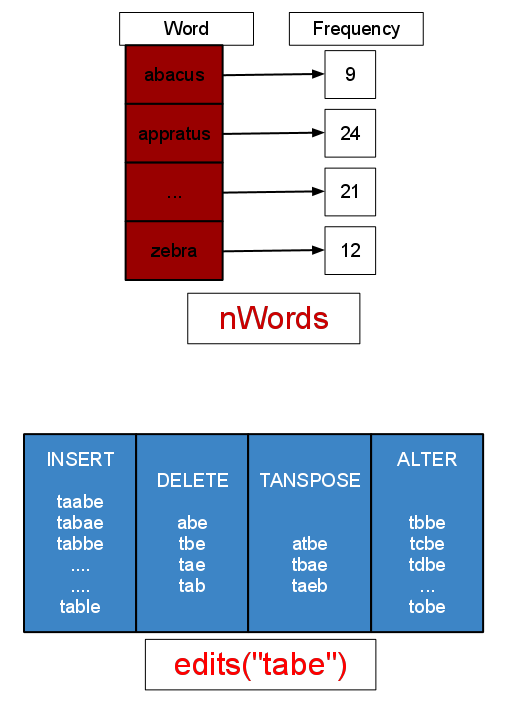 1.Initially Algorithms builds a dictionary* data-structure of words, from a huge English text. (so algorithm does not uses dictionary# file as such). This dictionary* contains words-to-frequency-of-occurrence mapping. lets say it as nWords. Lets say name of this list is 'edits' , note that all words in this list are just 1 step away from original word. 3. 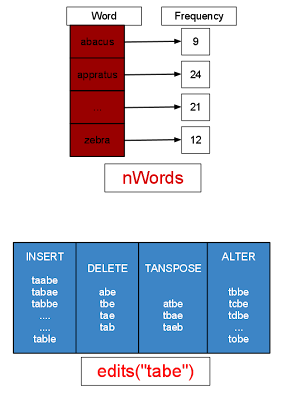 If edits has 1 or more words that exists in nWords, then it returns the word from nWords with maximum frequency, as a result. Then call function correct() to get the corrected word as result. Note:This code is just to demonstrate the algorithm, modify constructor to build dictionary directly from file. You can also avoid calling sort operation in function 'correct'. Thoroughly understand the code before using it. Notify me if you find any critical problem. excellent translation of the code. I have a question, how this code works with Spanish? @slietra I am just wondering if this comment is spam??? u really have a question?? Yes, i thinking in create a word games and i need check if a word existe really. I found the error , and i will fix the same. just to confirm u are talking about the redundant check , right??? as it would be better to build the string for the dictionary, you have an example? @slierta Hey I never replied to you sorry! Yes this will work for Spanish as well, basically this implementation never uses any dictionary, dictionary is built using some long text (of any language ) on the fly. You can keep improving the dictionary as well. Yes, its simple just pass a huge text (which is correct), it will build that language dictionary, thats it!